Maglianero Café may be well known to workers and residents in the Burlington waterfront hood, but something less familiar is just past the coffee counter, up a ramp and beyond the bike parking: a tiny T-shirt store without even a sign over the doorway. 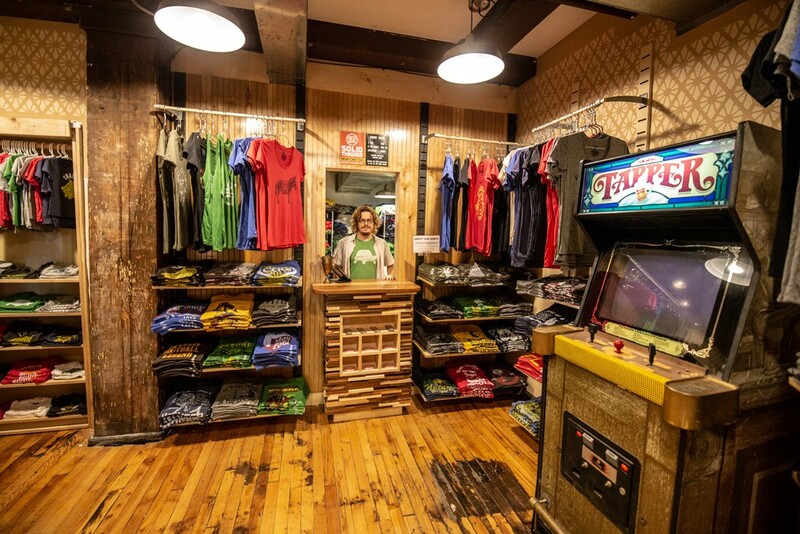 Racks of colorful tees line the walls. The vintage-inspired designs run the gamut from political commentary to silly slogans. A take-out window serves as the point of purchase; a vintage Tapper arcade game provides décor. This spot is the only current retail space for Solid Threads, and it's called the Sneaky Boutique (pronounced bo-tee-kee) due to its obscure location. The unassuming venue conceals a richer story: Though the boutique opened in December 2017, Solid Threads got its start almost 20 years ago — and not in Vermont. The idea for a T-shirt operation came to Brian Carr as part of a project in his first-year business course at Bucknell University in Lewisburg, Pa. Carr was set on designing a shirt with the phrase "Find a Party and Get Housed" in reference to a university drinking tradition. His professor told him the slogan was too risqué to be used in class, but the idea stuck with him. "So I found a local printer in town," Carr said. "We did the first run and sold out that first weekend, right away." Even after starting a job at a pharmaceutical advertising company in Manhattan, Carr made time for his passion. He spent his evenings learning about graphic design, thinking up T-shirt ideas and eventually debuting a Solid Threads website. The site, however, was not as successful as he'd hoped. Close to accepting a future in pharma marketing, Carr applied for a promotion at his company but was turned down. The rejection was the motivation he needed to strive for something more — or, as Carr put it, to "get out of that type of existence where you're just in the cubicle jungles, or you're a cog in the wheel, turning these anonymous gears." Carr exhibited some of his T-shirts at a festival in his hometown of Hoboken, N.J., and ended up selling so many that he quit his day job. He began street vending full time. A pivotal moment came in 2005 when a former Urban Outfitters buyer ran into Carr's T-shirt stand and gave him a contact at the company. Four months later, Carr received the largest order of his life: 2,400 shirts. The requested shirt, bearing the slogan "I'm a Drinker, Not a Fighter," became one of Urban Outfitters' best-selling shirts. It can be spotted in the 2006 movie The Break-Up and the television show "It's Always Sunny in Philadelphia." The sudden success fueled Carr to open a proper retail location in Hoboken. Solid Threads continued to expand over the next seven years, gaining more than 200 wholesale accounts worldwide. Carr unveiled new designs on a regular basis, attended biannual trade shows and managed six employees. And he was beginning to feel pressured. "I had been pushing so hard and grinding so hard to even create the business and then open up the retail store," Carr said. "And then it had gotten to a point where everything I was trying to escape from the corporate scene became my reality." Two natural disasters served as his impetus for change. After Hurricane Irene in August 2011, he was forced to rebuild the damaged Solid Threads retail store. Nine months later, Hurricane Sandy wiped it out completely. "To have Sandy really destroy it, it was one of those I-give-up moments," Carr commented. "And it was really fortunate. It just opened up this whole new perspective." Carr let go of his bricks-and-mortar space and hit the road, though he maintained his wholesale and online business. He visited Anguilla, traveled through the southern United States and came north to the Adirondacks; he planned to go to Martha's Vineyard, Mass., next. But en route, Carr spent a weekend in Burlington and knew immediately that he'd found his next home. "It was the conversations and the openness that I found [that stuck out to me]," he said. "Sitting at a bar, having a drink, and getting into conversations and topics with people that I didn't know, and having a more illuminating discussion than I would find in a year in Hoboken [at] a random bar." Carr, now 36, settled in Burlington on December 1, 2013, and ran his business from his kitchen table. After reading about coworking spaces in Seven Days, he went in search of Karma Bird House — in the same building as Maglianero. "I saw a door you weren't supposed to go through, and I went through the door and ran right into the owner of the building," he said. That was Michael Jager, cofounder of Karma Bird House and chief creative officer of brand-design practice Solidarity of Unbridled Labour. He gave Carr a tour of the building. The serendipitous encounter landed Carr an office. With a new home and a comfortable place to work, Carr began to expand his business in ways less tied to profit than previous ventures. He'd had a long-standing idea about a charity-based line of T-shirts, but it had never panned out. Carr collaborated with documentary filmmaker and University of Vermont lecturer Nilima Abrams, founder of the cause-marketing enterprise Splice Cream, and together they brought Solidaritees to life. Meeting and having dinner with Sudanese refugee Achier Mou provided the catalyst for the first shirt in the line. Warfare had separated Mou from his family when he was a child; after fleeing to Ethiopia and then Kenya, he resettled in Vermont in 2001. A graduate of UVM with a master's in global health from Tufts University, Mou was preparing to return to South Sudan to run a medical-training institute. "I could just feel his ease and joy with life, despite all the tragedy that he faced," Carr said. He decided to dedicate a shirt to SUDEF — the Sudan Development Foundation — of which Mou was (and still is) the board chair. The organization provides much-needed medical care to people living in South Sudan. Finally in the right mind-set to create a cause-focused design, Carr came up with the "Strong Like Bull" logo. All profits from sale of the shirts are donated to SUDEF and have generated nearly $10,000. A more poignant encounter inspired the most recent Solidaritees collaboration. Manuel Oliver had seen a Solid Threads shirt in a retail store with the slogan "Holy Guacamole" and thought of his son Joaquin, who was killed in February in the Marjory Stoneman Douglas High School shooting in Parkland, Fla. Joaquin had gone by the nickname Guac, so Oliver reached out to Carr about customizing the shirt in remembrance of his son. After learning more about Oliver's story, Carr decided to devote a shirt to sensible gun control. Abrams came up with the concept "Books Not Magazines," and the design launched in August. Half of the shirt's profits are donated to Change the Ref, a nonprofit founded by Manuel and Patricia Oliver, Joaquin's mother, that works to empower future leaders. Even as business was running steadily and successfully from his Burlington office, Carr found that he missed having a physical Solid Threads shop. "What I realized through the hurricane experience and through everything, this journey coming full circle in a way, is that I do want a retail space," he said. "I love that visual merchandising element and chance for people to interact and engage in person." Carr noticed a supply closet in the Karma Bird House and suggested turning it into a store. Giovanna Jager, who manages leasing in the building, agreed. "I liked what his vision was for the space. It was unique," Jager commented. She helped him install a proper storefront door and a take-out window through which his associates can assist customers while simultaneously fulfilling online orders and wholesale requests. Though most visitors to the Sneaky Boutique stumble upon it unplanned, Carr likes the secluded feel. "I purposely chose a spot that would be visible ... for people to come in and say, 'Oh, this is what Solid Threads is about,'" he said, "but where it has to be sought out." Solid Threads seems to have hit a comfortable stride in Vermont. Carr believes that landing in Burlington helped him to focus on balancing the needs of the business with his needs as a creator. "It gave me time and space to just kind of sit still and really dig into who I am, what I want — and connect with people who can encourage and foster that," Carr said. "It really has nurtured things that I knew I wanted to create in my life but I didn't consciously [or] intellectually know how to do." Next up: a Vermont-specific line that expresses Carr's appreciation for the state. The designs will touch on the recent legalization of marijuana, as well as the nature and beauty of the state. He's hoping to release the shirts before the holiday season. It's not just Solid Threads that's putting down roots. Recently engaged to another Vermont transplant, Carr doesn't see himself leaving Burlington anytime soon. "I feel like I was always trying to find a home," he said, "and I feel like I have, here." Correction, October 1, 2018: An earlier version of this story misstated the slogans on two of Brian Carr's T-shirts. The original print version of this article was headlined "Fits to a Tee"